It only takes a 1 bad comment from you to spoil your goodwill. Web Comment Etiquette is about handling good or bad comments on your food blog or YouTube channel. This article certainly is meant to talk about the web comment etiquette that we have learnt over time and some of them, the hard way. When we started this blog and our YouTube Channel, we had no idea of how to handle a bad comment. 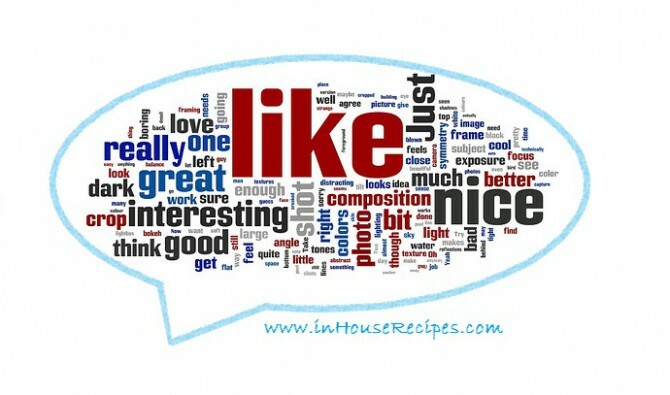 Good ones are liked by everyone but what to do with a bad mouthed comment? Here are the learning’s that we keep in mind while moderating comments on our web presence. Should you reply to an abusive comment? Recall the old saying: Ever to wrestle with a pig? You get dirty, and besides, the pig likes it. There are going to be people in this world who want to malign your channel or blog post, because they do not like you or your popularity. So, you will sometimes find some comments which try to abuse your work. In this kind of scenario, the best option is to remove the abusive comment from your page or block the user from writing comments if he/she repeats. In the other case, where the language is not abusive but the comment still is criticizing your work, you should take a deep breath and reply with cool head. Should you delete or reply? There are people out there who would sometimes or may be always, write only the critical review of your recipe/work.It is perfectly fine and you should appreciate that people are sharing their genuine feedback. This would certainly help you improve your recipe or work.There is a very thin line between a critical review and a bad mouthed review specifically intended to bring bad publicity for your work. You are the best person to judge on those counts.If the comment is a genuine review and gives a feeling that the person has seriously tried your recipe or have seen the video, you should reply politely and agree to making improvements in the future recipes/work. Then, you can easily infer that they are intended to just provoke you to reply in a bad manner. It also shows that comment writer is NOT interested in highlighting the issues and help you improve them, but is targeting you. You have the choice here, either you remove the comment or reply. I guess most of us would simply remove the comment as we fear the bad publicity. But, I would suggest otherwise and to reply but with a polite and useful comment back. Think from the point of view of a third person reading your conversation and you certainly would want to give an impression that even though the user wanted to malign, you (as the owner of the blog/channel) still wanted to help him out. Do not reply when you are angry i.e. immediately after reading the comment.If you feel that the comment is not in good taste, take your time to analyse and then reply when your head has cool down. This will certainly help you respond in a much positive way than you would have done it otherwise. Remember the rule of thumb – never ever reply in the same tone as your visitor did.I am 100% sure that if you do so, you will get the most downward hit with your language than the visitor who started it.Simple example would be: If a common man in the crowd criticizes Shahrukh Khan’s work and SRK reverts back in same hot tone, who will get the most hit on his public image? The basic principle is that other guests/visitors on your site know you and your work. They are completely un-aware of the visitor who had left a bad comment. So, if you start abusing, your image is bound to take a hit with your existing guests and followers. Hence, if you find a bad comment/critical review, you should just accept it with extreme politeness and that should raise your goodwill with your fans. Thanks dear for watching and writing in. And yes, we do have some solutions in mind also so that you guys can skip that talk too..lets see how it goes.. If you are on YouTube/Blog and sharing your work publicly, you are a public figure irrespective of how small or big the venture is. And with public figure, comes the people who want to make personal comments, personal attacks with the sole purpose of maligning your public image. It depends a lot on the type of comment to decide if it is constructive or destructive criticism. There is absolutely no harm in accepting the the positive and healthy personal criticism but, it depends a lot on you as person and your comfort level to share and talk about personal matters. This is one of the real comment that we received on one of our videos. It is an example of direct criticism of personality. We chose to remove it from our comments as we do not want to talk about our personal appearances. But, Maahi did work on reducing weight and Anil on speaking less!! you cant cook u fattie, and your stupid husband cant either stop trying. Another example where it was a direct personal criticism of the capabilities of Maahi teaching recipes. There is no healthy suggestion that seem to come of this comment where we can find an area of improvement. It simply just tries to discard all the work and effort. The comment would have made sense if it had pointed out specific mistakes or areas of improvement to be counted as healthy criticism. We concluded that it is ONLY meant to defame us and hence removed it from the channel. You need to learn cooking from other recipe video channels. Please take some classes and then come back and teach others. One more….this was really a funny one though..
Love ur husband and his dimples….I am ready to turn a gay for him.. Thanks for watching us and writing in with such sweet words. This is a pretty trivial situation where 2 or more of your users/guests are fighting or abusing each other. What should you do? Never ever get yourself involved in the fight. You, as a blog owner/moderator have the responsibility of maintaining healthy discussions. Remove the abusive comments and stop the discussion that gives and impression of a fight. A fight even if it gives and impression that a particular user is trying to defend you is not going to help you with your blog/youtube-channel’s goodwill. You should politely ask the guests in the discussion without favoring any one of them to stop it immediately and indulge in a healthy talk. After all, they all are on your blog with a common aim of learning something unique that you have shared. This chit-chat appeared on the Pasta recipe video. comment from guest 1: bakwaas recipe. Reply comment from guest 2: there are different ways to make pasta desi videsi and bla bla y not just enjoy another method of making pasta? rather than criticizing? Reply comment from guest 1: how can u call this recipe white pasta. A good comment is an asset and who does not want it to be featured on his blog? But, it still needs a reply. Keeping silent by not replying would be a waste of opportunity.The idea of replying to your guests is to involve yourself in a healthy discussion. If they have a question, a to-the-point answer is what is needed. Don’t try to confuse if you do not know the answer. A simple acceptance that ‘I do not know’ would be a much better answer than confusing/contradictory or no-response. If it is a compliment, a thank-you would certainly help the visitor realize that his/her time is valued by you. Thank you so much for sharing this recipe, I cooked it for the guests on my daughter’s 2nd birthday party and it was a hit. It was the best praised dish in the party. ohhhh thats such sweet comments..
i am glad that everyone liked it and you shared the feedback with you..
God Bless the little baby ..many happy returns of the day to her..
Hope you try my recipes in future as well. Always try to engage the visitor in the communication of your reply. Address the person with his/her name. This gives significant mileage as the person would feel that it is not an automated response by someone on your behalf or a computer program. Last week I invited some of my friends for dinner at my home. For my vegetarian friends, I made this Paneer tikka masala. You will be astonished to learn that every one, including my non-veg friends also appreciated the recipe and within no time they finished the whole dish. Some of them not even tasted my non veg dish, like chilli fish and chicken curry. Thanks for sharing such a wonderful recipe. For a variation I used three types of colored capsicums red, yellow and green to make the dish more attractive. Keep sharing such wonderful recipes. Hope you try many other recipes and write back with feedback.It sounds like a good modification of adding varied colored Capsicum. We would also love to try this. Try to respond within 24 hours of the comment to make your visitors feel connected. A person reads your blog post or watches the whole video and asks you a question in comments. This question is straight-forward and has already been answered in your blog post/video. This happens a lot with every every blog especially the food blogs. People tend to quickly see the video/read the recipe and tend to miss on the basic things. They then come back and ask the question in comments. You, as the moderator would feel irritated. That’s OK. You have the right to do it. But still, Never ever reply back in the bad tone. You can always reply by referring the section of article/video where the question was answered. I would also advise to add the answer also in your reply for easy understanding of the guest. Don’t abuse or make fun of the comment-writer’s ability to find the answer himself from the video or blog post. Don’t reply in the tone of making fun of the question. No question is stupid and hence should be answered. We have faced this situation where people have asked us the simple questions like ‘How to know if a potato has boiled?’. It may sound simple to you, but for a fresher in cooking, this is the toughest one to crack! Respect each question. What about your own experience? I am sure you would have also faced some tricky comments and un-wanted situations while managing a blog. Do share them with us in the comments. Also, your questions are most welcome.